I have found that no matter how much drawer space I have it seems it’s never quite enough. I can’t imagine I’m alone in this so I thought I would share some little tricks I use to make the most of what space I do have. Here I used cardboard dividers that came with Christmas ornament storage boxes that I bought to use for storing other items. 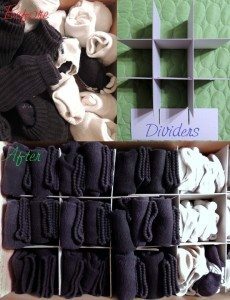 Not wanting to toss the dividers I soon found they work to organize socks. They not only keep the them tidy looking, they make it possible to keep them folded instead of turned inside themselves which can cause the elastic to break down. These dividers can easily be made using poster board (I recommend gluing two boards together for stability), foam core or even balsa wood.